Working in forestry was one of Speers’ first operations, and continues to be part of our business today. 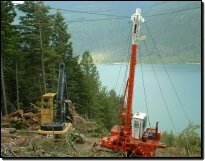 Speers has worked in five main areas of forestry: Road Construction, Right of Way, Conventional and Cable logging and Log sort yard operations. 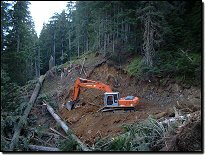 The many challenges of logging and road building in the “Interior Wet Belt” have given us the opportunity to implement progressive and creative ideas. The steep, wet terrain, poor soil conditions, large wood and abundance of precipitation are dealt with daily. As a commitment to our customers, our management and crews are trained in SFI (Sustainable Forest Initiative) Certified and ISO 14001 EMS (Environmental Management Systems) certified. Road construction in the Interior Wet Belt is as extreme as it gets in British Columbia. Progressively, one of the first people in the interior to utilize the excavator for road building in the 70’s was Ray Speerbrecker. The majority of the roads we build today still involve the excavator as well as dozers, articulating rock trucks and rock drills. 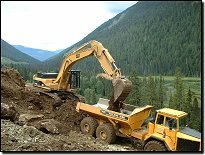 With the Forest and Range Practices Act, road building has changed considerably with end hauling, engineered fills and full fills being common place in most of our jobs. We ensure all of our staff are provided the proper training and are kept up to date with changing regulations. Working with geotechnical reports as well as other professionals and map readings are all part of the business for both employees and management. In order for a road to be built, right of way logging must be performed first to remove the timber in the area. It was soon realized that depending on another contractor to perform right of way logging was not the best fit for Speers. In order for our road construction crew to continue without delay, Speers would have to have their own right of way crew. This also gave us the ability to utilize the equipment between the two crews and be able to provide our customers with outstanding performance throughout the job. In order to keep Speers’ crews and equipment working in the winter, block logging was a natural progression. Block loggings process is very similar to right of way logging, but on a larger scale. To minimize ground disturbance, the majority of the conventional logging is done in the winter months by utilizing the snow pack. Speers Construction has done selective, small patch blocks, steep slope and clear cut logging. The steep terrain in the area brought Speers yet another operation. Where conventional logging just wasn’t practical, cable logging became the process of choice. Logs are lifted off the ground by suspended cables and winched to the yarder. 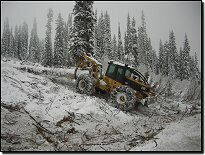 As no mechanical equipment is utilized on the steep slopes, ground disturbance is kept to a minimum. Due to the tight working quarters on the steep ground, a heel boom is used to work with the cable yarder.